Two Special Forces Soldiers KIA in Kunduz Battle. 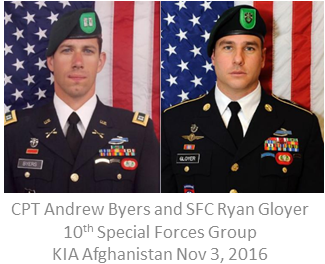 Two members of the 10th Special Forces Group died of wounds received during an engagement with the Taliban near the northern city of Kunduz, Afghanistan on November 3, 2016. CPT Andrew Byers and SFC Ryan Gloyer were based at Fort Carson, Colorado - the home base of the 10th SFGA.